Weddings in Rebate is intended to provide an affordable wedding package which can be added to, to suit your personal needs for your wedding or vow renewal on the Costa Blanca, Spain. We understand that one of the most important days of your life is very important to you and will guide you through the process to make your day as stress free as we can. Instead of organising everything yourself we offer a coordinator that has access to the best services relevant to your needs to ensure your day is perfect. She is the in-house wedding planner of Rebate a.k.a the sister of the owner Eva. Wedding coordinator – your main point of contact throughout the process. Wedding cake maker – offering tastings before the big day and of course spectacular cake. Wedding videographers – letting you enjoy the special day for years to come. Wedding photographers – ensuring your day is captured in the most special way. Wedding DJ – helping you and your guests party into the night. Wedding singers – a little extra entertainment to really get the party going. Wedding florists – making the venue look extra beautiful and pulling all the colours and themes together. The Costa Blanca is well known for its miles of beautiful coast lines and crystal clear waters, it has so much more to offer. Gorgeous small towns are tucked away from hustle and bustle of the coast. The village of Rebate is one of them and still only 15 miles from the coast. Surrounded by floral orange groves and wonderful countryside. 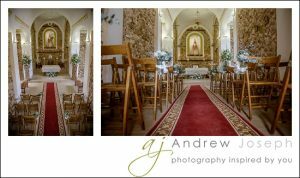 The picturesque church is a perfect place for the ceremony, it really is pretty as a picture. The restaurant and the church are all owned by one family and it has been that way for many years. You get a wonderful feeling of being transported to another place and hundreds of acres of orange groves really does give the venue a perfect sense of tranquility. The restaurant overlooks the grounds which house ducks, peacocks, carp, tortoise and a special Emu called Vanessa! This all adds to the lovely ambiance of Rebate. Please take a moment to look through our weddings in the Blog.